Discussion in 'E3D-v6 and Lite6' started by AlexC, Mar 25, 2014. I have a home built Taz with a direct pinch setup that had been working for about 6 months with a j-head MKV, recently that j-head clogged up with an actual blockage, so i decided to try this e3D all metal hot end while the j-head "soaks" in MEEK. I followed all of the direction on the build except i choose to use a different thermistor (cant deal with those hair thin thermistor leads (#6 rather than #5)) and i change my marlin code to adapt to the #6. The final build if you ask me looks clean and is solid,. with absolutely no chance of shorting the thermistor (double insulated with PTFE tubbing). the plugs i use are the exact same plugs the ubis uses,. so they are well tested for use on a hot end, capable of the current, and the thermistor gets gold plated pins for minimal contact resistance,. But with this hot end,. its a near constant fight to keep it from stalling the motor and skipping steps,. it will start ok, but then within the first few minuets it starts to skip, this of course starts to print voids,. and if enough voids happen it ruins the print,. I have tried every temperature possibly prior to burning the actual filament,. and i have found that if i start low, say 200c and then when the first skipping starts i bump it up to 205c, it will then print for a few more min until it starts skipping, then i bump it up to 210c,. few more min,. 220c,.. few more min,. by doing that i can get it to print for about 30min before it just totally locks up and then the print fails. After the print fails, i cant even push the filament by hand anymore,. its more stuck than i ever have seen filament stuck before,. but if i pull it out,. cut it off, and push fresh in,. bam slides right through again, so no clog,. of course once i start a new print the time to lockup is 100% going to happen again,. somewhere between 20-30min of printing,.. I have the cooling shroud as low as it can go without going past the fins,. (started with it middle), in all situations the heatsink is only mildly warm to the touch i would almost say its cool to the touch, but not quite (can hold it indefinitely) it never really gets hot up there no matter where i put the fan really,.. I am using an ABS hotend plate to hold the top of it in place,. and that shows no softening or melt warping at all,. I have slowed the printer down to 20-30mm/s,. still jams up every time,. At this point iv wasted an entire week trying to get this thing to print,. i can tell that in that 20-30 min prior to jamming its printing exceptionally well,. so i really, really want to make this thing work,. but like others i am literately pulling my hair out on this one,. I have serviced the 30mm fan (added super lube to the bearing shaft) to make sure its running at its best,. (adding the lube reduced the mAh draw by a fraction so it did help), and i have tried replacing the fan as well,. none of that helped,. This printer is my PLA printer,. so i never push ABS or any other plastic through it,. i like to keep a hot end for every plastic so there is no mixing (makes cleaning nozzles allot easier),. so on this hot end i only have interest in tips towards making PLA go through it without jamming up. Please don't make me switch back to that j-head,..
Any help would be appreciated,. Thank You,. Have you tried reducing the length and speed of retractions? I have to comment on your printer, It is one of the nicest designs that I have seen. Is there a BOM available for it or did you create it from scratch? I'll play with adjusting the retract,. see where that gets me today. you know as i watch this 0 retract print test,. i was just thinking,. if the outside diameter of the thermal break (thermal pinch point, thermal bottleneck whatever you want to call it, the narrow bit between the heatsink and the heat block) is the same for a 1.75 and a 3mm version of the e3D shaft tube, then that's going to generate a vast difference in (and its clicking already that was fast) the heat transference since the thickness of metal at the pinch is nearly 2.5 fold for the 1.75mm version,. does anyone know if the outside diameter is different at the pinch for 1.75 vrs 3mm version? yeah this print just stopped extruding with 0 retract (~8 min in) so that's not it,. hmm,. n/m on that just took mine apart to look for problems,. the OD of the pinch on mine is 2.84mm so a 3mm version would obviously be larger,..
And looking at the filament i pulled out after this last jam, (i put the clean end in to check depth,. and its about 1.5mm deeper than i am holding it here) so its not really melting past the heat break,.. but it is melting inside the heat break,. though I am not sure if it should be melting in or before the heat break. It is great that you are able to provide so much detail!! Makes debugging the problem much easier - although the root cause is still not entirely clear to me. Since you seem to have all the common causes of jamming ruled out, I would like to test a hypothesis on your set-up. If you want to have a go at adding a very thin film of oil to your filament and then extruding by hand. If I remember correctly Tim Rastall was giving someone instructions on a technique for how to season a nozzle, but I can't find it so have just dropped him an email in the hope that he may be able to provide some advice..
We will get you printing, even if it means sending you a replacement extruder..
P.s. You are correct regarding the thermal-barrier in the heatbreak - there is a 0.4mm wall thickness in both 3mm and 1.75mm models. Check out our documentation http://e3d-online.com/Documentation for the full v5 drawings. Josh has asked me to step in here to provide a bit of experience on reducing PLA jams. In some cases, for some reason, some folk have the problem you are describing with PLA. The issue seems to be that the heatbreak gets a bit too warm to the extent where the PLA will soften and a jam occurs. It appears to be a PLA only problem and it's exacerbated by the stickiness of PLA vs ABS. 2 - season the internal surfaces of the hot end with cooking oil. This might sound crazy but I've seen it work first hand with the Kraken. PLA is a sugar and molten sugars stick to bare metal like stainless steel, in the kitchen you prevent this by creating an oily patina on the metal surface by baking a thin layer of oil onto the surface. There's some science to this but I won't go into it here. Simply dip the end of a piece of PLA (10mm or so) in canola oil or something similar, heat the hot end to about 180 degrees and insert the oily pla into the hot end, press it through with you fingers until it exits the nozzle then extract the oily pla, then push 50mm of unoiled PLA through. Repeat this as many times as you like, I had success just doing it once. The hot end will fizz and pop while you are doing this as you are effectively frying the pla, for me it smelt strongly of cooking donuts This is why you need to push an unoiled piece through to purge any excess oil. I look forward to hearing how you get on Alex.. I also noticed that the thermistor I am using on the e3D is not as smooth (on the saw tooth) as the (also #6) that i have on the j-head,. so I am starting to wonder if I damaged mine with over heating when I soldered it (I use non leaded silver solder (high melt point) and I just read that thermistors can be easily damaged by high soldering temps,.. that i am certainly guilty of). SO, i'm going to wire up the stock thermistor that came with the e3D, with crimps, when I re try tomorrow. if that does nothing, then ill season,. And ill get that modded fan duct printing on my ABS machine today. More tomorrow I am sure. Sorry to hear that you have had to switch back.. lucky you had the forethought to have a swappable holder. By the way, tiguu was having a jamming problem, I asked him how he got on, and the seasoning seemed to work for him - http://forum.e3d-online.com/viewtopic.php?f=7&t=33&p=395#p369..
Re. the thermistor, that is odd. You are correct that they can be damaged by high temperatures, but this normally manifests itself more subtly, like a skewed response curve causing incorrect readings. With that said I am no authority on the matter. Let us know how you get on with the Semitec supplied with the E3D.. Sorry had a hard time getting to this today,. but all of tomorrow i should be able to focus on it,. AlexC, are you using retracts? If so, what is your retract speed and length? I've found that turning the retract speed waayyyy down eliminated the last PLA jamming gremlin I had. I'm running at 2-3mm length and 20mm/s retract speed. Hi AlexC, your description of the problem and troubleshooting was very clear. I had the same identical problem, so I'm very happy to hear that a possible solution was found. I know how good are the E3D hotends and how Sanjay, Josh and David works hard to give the best product: I'm using two v4 since august on the old BadPrinter2 and they works for 7 months without a single clog, so it is very strange for me to see this behaviour on these new v5 and probably is due to some batch of the heatbreak with tolerances problems or something like this. I bought 4 v5 to use on our first two prototype of the BadPrinter2 and I'm encountering this type of strange clogging (after 15 - 30 min of printing) with PLA only exactly how you described on 3 of 4 hotends up to now. I ran multiple tests with retract completely turned off,. got a bit of early drool for the effort, but no decrease in jamming/skipping at all.. i figure if it does it with it completely turned off no other setting with it turned on would help, aka while it may be a factor of the issue, its not the only one.. Going through the cleaning process right now, to do the "seasoning", as i imagine the oil has no chance to get to the metal if its coated with stuck on PLA,. this is bloody annoying,. more in an hour or three,. The focus/depth of field on this is microscope are extremely narrow,. that's why the big chunks disappear in some images,. the ridges are at different depths, though they all seem to be near or around the heat break, but even a .5 mm focus shift can make things disappear into the blurr on this microscope.. I also shot a video that moves the focus along the inner shaft showing the multiple ridges, but i'm not a video guy and this file is 1.3gigs so i'm trying to figure out how to shrink it. I will continue to try to clean this and season it,. but if this is as far "off" as i think it is in terms of "High quality surface finish" I would appreciate a 1.75mm heat break replacement sent ASAP. Here we go this one shows the "worst" area the best,.the hard full circle ledge where a bunch of stuff is stuck,. and you can even just barely see the other ledges at the edge of the focus. this is right at the start of the heat break closest to the nozzle,.. nowhere even remotely close to smooth,. I should also add that this barrel has only seen ~30-40, short, failed, test prints,. and only with clear/natural PLA, (what i always start new hotend calibrations with, the good stuff). so this stuck on black stuff, must be clear PLA thats so stuck its been baking there since the first few prints and has charred & hardened over just this short time. I am hoping for a replacement at this point, but I am also suborn, and am curious if seasoning will actually resolve this bad of a inner barrel, so will continue to try to make this one work while i wait on the replacement. I am going to leave this soaking in MEEK overnight to try to de-lodge the stuck on stuff, using a wood toothpick i tried to scrape it off but its not going anywhere without chemical assistance, and i don't want to scrape with anything harsher. tomorrow ill use natural cotton pipe cleaner soaked in more MEEK, with a little heat,.. to be continued,. in the mean time, two thermistors ready to go,. I didn't follow the directions,. again,. (sorry) i just dont like the idea of using kapton tape as an electrical insulator (more worried about the adhesive not being electricaly neutral, than the film itself), and right off the bat trying to use it was problematic. So i used two different sizes of PTFE tubing to make the super thin thermistor wires, double insulated, and a whole lot stronger. I decided to fold back about 5mm of the thermistor wire to help the crip hold the wire, and then used high temp adhesive heat shrink to insulate the crimps (hot air shrunk with thermistor kept cool wraped in a damp paper towel). I don't see how this could be problematic vrs the kapton instruction. (In my opinion its easier to assemble, and only added about 20 cents to the cost.) so the Semitec is ready for the taz once the barrel is cleaned and seasoned (or completely replaced), and then i also prepped a printrbot thermistor,. I figure if all else fails ill try this hotend on my ABS printer while waiting on the replacement heatbreak. The detailed photos of the heatbreak are very interesting to see, although it is hard to tell exactly how "bad" the surface is, because of the PLA that is in there. When you have chemically cleaned the inside maybe you could upload another photo? Or even just tell us how it looks. I am certainly thinking that it may be a good solution to send you a replacement heatbreak, but it won't go out until Monday anyway, so let's see how the situation develops.. Either way, I am sure we can do something to reimburse you for all this investigatory work! In the mean-time, go ahead with the seasoning process and let us know how you get on. Nice work on the PTFE tubing, that really does look neat. We are currently working on the v6 HotEnd which does eliminate the Kapton. Thank you Alex for the close up images of the heatbreak. Today we will try the seasoning process on two of the E3D v5 that we have installed on our printer, so we will update on the results. 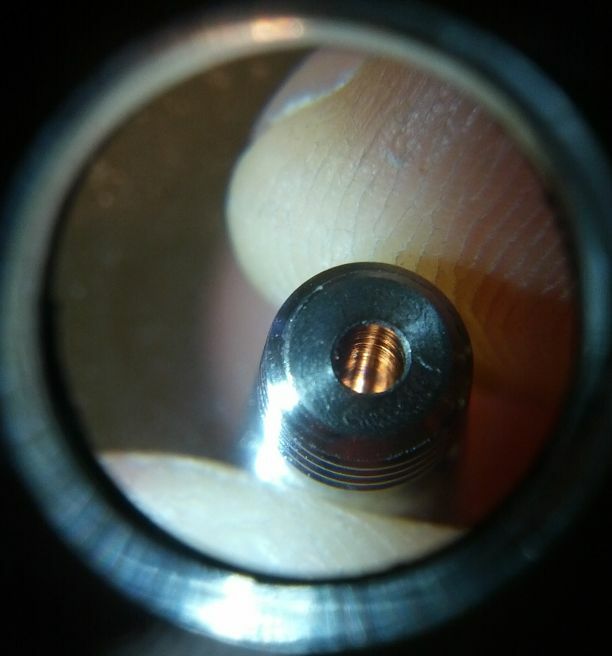 I have another heatbreak never used and I want to share a magnified photo of the internal of the barrel (mine is a cheap magnifying glass, so the photo probably is not clear as Alex) I can see some signs of drill inside the barrel and I think that can be the problem. I try to highlight them pointing a light source under the other side of the barrel. This barrel was never used, so I try pushing a cold piece of PLA inside with fingers and I think that it is possible to feel under the fingers that the filament doesn't pass through a smooth surface, but encounter some little obstacles. Hope this can help Josh to investigate better the problem.